My notes and the recording of my session are posted on my regular feed on the day of the conference, here. Also available, is a recording of my talk. Copyright, caught in a digital maelstrom (Trudel, 1997) of perpetual reforms and shifting commercial practices, exacerbates tensions between cultural stakeholders. On the one hand, copyright seems to be drowned in Canada and the USA by the role reserved to copyright exceptions (Crews, 2015) by parliaments and the courts. On the other, institutions, such as libraries, are keen to navigate digital environments by allocating their acquisitions budgets to digital works (Farb, 2006; Waller, Bird, 2006). Nordic countries have explored new institutional arrangements, such as extended licensing which have proved useful for orphened works (Rosén, 2012). How can markets, social systems and institutions emerge or interact if we are not able to resolve this tension? Beyond the paradigm shifts brought by digital technologies or globalization, one must recognize the conceptual paradox surrounding digital copyrighted works (Elkin-Koren, Salzberger, 2013). In economic terms (Maackay), they behave naturally as public goods, while copyright attempts to restore their rivalrousness and excludability. Within this paradox lies tension, between the aggregate social wealth (Frishmann, 2012; Yoo, 2007) spread by a work and its commoditized value, between network effects (Benkler, 2006) and reserved rights. 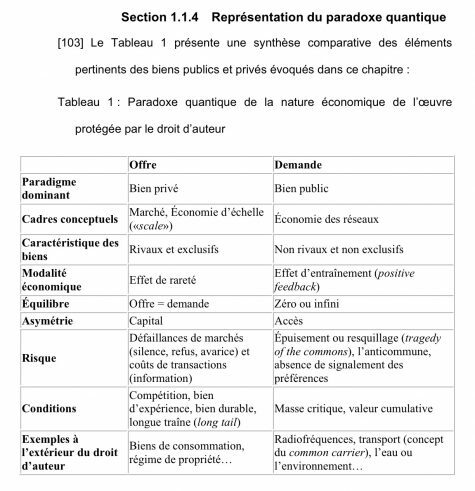 In the image below are presented side by side both paradoxical theorizations of copyright: property theory (exemplified by supply-side theories) and utilitarism (represented by demand side approaches). This table is taken from page 66 of the author’s doctoral dissertation. The next image offers a more pragmatic synthesis of the same issues. It is taken from page 16 of a copyright guide for Québec school librarians on which this author contributed and draws from yours of research and advocacy on copyright. 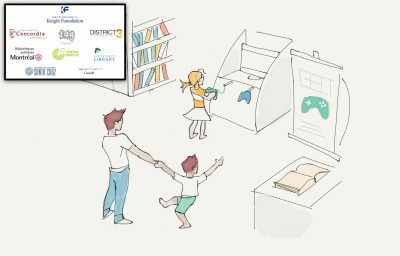 In this paper, I will summarize the findings of my doctoral research project and apply them to the case of digital games in libraries. The goal of my doctoral work was to ascertain the role of libraries (Hirtke, Hudson & Kenyon, 2009; Larivière, 1989; Gordon, 1982) in the markets and social systems (Luhmann, 2004) of digital copyrightable works. Ancillary goals included exploring the “border” between licensing and exceptions in the context of heritage institutions as well as building a new method for capturing the complexity of markets and social systems that stem from digital protected works. To accomplish these goals, I analysed a dataset comprising the terms and conditions of licenses held by academic libraries in Québec. I show that the terms of these licences overlap with copyright exceptions, highlighting how Libraries express their social mission in two normative contexts (Belley, 1996), positive law (copyright exceptions) and private ordering (licensing). This overlap is both necessary yet poorly understood – they are not two competing institutional arrangements but the same image reflected in two distinct social settings. It also provides a road-map for right-holders of how to make digital content available through libraries. The study also points to the rising importance of automation and computerization in the provisioning of licences (Garnett, 2006; Mountain, 2003; Gillette, Radin, 2000) in the digital world. Metadata describing the terms of a copyright licence (Maurel, 2007) are increasingly represented in computer models and leveraged to mobilize digital corpus for the benefit of a community. Whereas the print world was driven by assumptions and physical limits to using copyrighted works, the digital environment introduces new data points for interactions which were previously hidden from scrutiny. The future lies not in optimizing transaction costs but in crafting elegant institutional arrangements through licensing. If libraries exist to capture some left-over value in the utility curve (again: Frishmann, 2012; Yoo, 2007) of our cultural, informational or knowledge markets, the current role they play in copyright need not change in the digital environment. What does change, however, is hermeneutics: how we attribute value to digital copyrighted works and how we study society’s use of them. We will transpose the results of this study to the case of digital games. Québec and Montréal are currently hotbeds for both independent (indie) and major (AAA) video game studios. 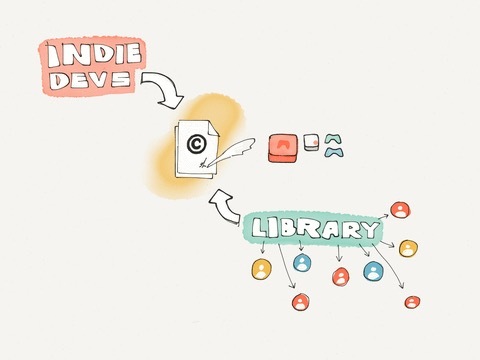 Despite this, a market failure currently exists due to the absence of flexible licensing mechanisms to make indie games available through libraries. This part of the study was funded with the generous support from the Knight Foundation in the USA and conducted at the Technoculture Art & Games (TAG) research cluster of the Milieux Institute for arts, culture and technology at Concordia University in Montréal, Canada. Most notably, Libraries must still rely on physical copies of media to constitute their collections of digital games. This is mostly due to restrictive licensing from all major game platforms (iTunes, Google Play, Steam, etc. ), which only allow individuals to transact. In that sense, platforms or marketplaces providing access to digital games – and most other digital works for that matter – are closed to libraries. This is in stark contrast to markets for physical books or that of physical media such as disks – because exclusionary practices are eschewed or because of copyright exceptions (such as the case of the first sale doctrine in the United-States). Using licensing to ward off libraries from digital markets will be problematic in the medium to long term. In fact, because digital works are simply unaccessible by libraries, it is unclear how copyright exceptions as well as extended licensing, as implemented in Nordic Countries, could solve this issue. No amount of legislative reform or litigation could have an impact on this problem in the short term. We hope that new institutional arrangements, achieved through private ordering or licensing, could point the way forward. For example, to solve this issue for e-books, public libraries in Québec created a new collecting society to foster the emergence of a new institutional arrangement with publishers. 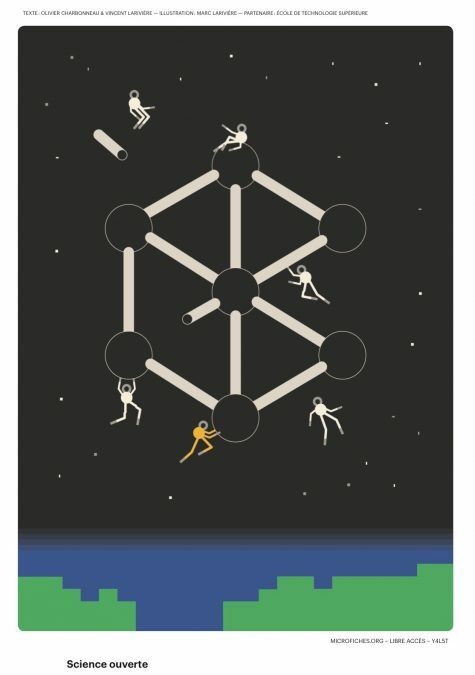 Using the concept of the commons (Benkler, 2017), our research team at Concordia University is seeking a similar path for born-digital games, prototyping a new institutional arrangement using blockchain technologies. Our goal is to allow for the drafting of smart contracts, fostering micro-transactions on an open ledger as well as using asynchronous encryption to open this digital marketplace. In turn, we hope that this model will allow libraries to play their role for society and allow society to reap the positive externalities of its libraries’ mission. Libraries may even be able to dent the market dominance of existing digital platforms. Benkler, Yochai. “Open-Access and Information Commons.” In The Oxford Handbook of Law and Economics: Volume 2: Private and Commercial Law, edited by Francesco Parisi, 257–79. Oxford University Press, 2017. Belley, J. G. 1996. “Le contrat comme phénomène d’internormativité.” In Le droit soluble : contributions québécoises à l’étude de l’internormativité, edited by J. G. Belley, 195–232. Paris: L.G.D.J. Belley, Jean-Guy. 1992. 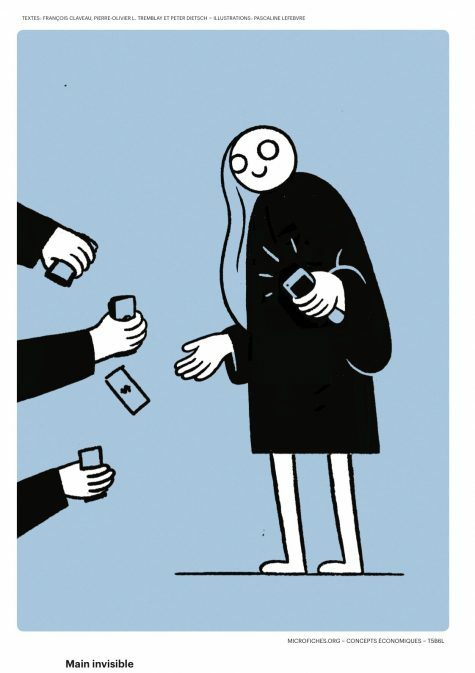 “Les Transformations d’un Ordre Juridique Privé. Les Contrats d’approvisionnement à l’ère de La Cybernétique et de La Gestion Stratégique.” Les Cahiers de Droit 33 (1): 21–70. https://doi.org/10.7202/043126ar. Crews, Kenneth D. 2015. “Study on Copyright Limitations and Exceptions for Libraries and Archives: Updated and Revised.” SCCR/30/3. Standing Committee on Copyright and Related Rights. Geneva: World Intellectual Property Organisation. http://www.wipo.int/meetings/en/doc_details.jsp?doc_id=306216. Elkin-Koren, Niva, and Eli M. Salzberger. 2013. 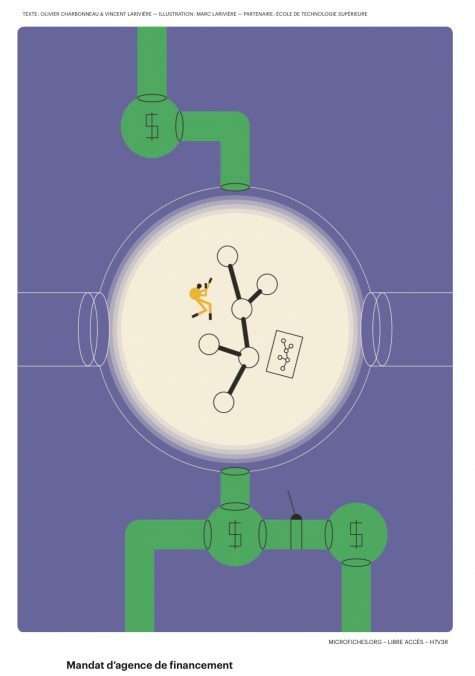 The Law and Economics of Intellectual Property in the Digital Age : The Limits of Analysis. Book, Whole. Abingdon, Oxon England]; New York: Routledge. Farb, Sharon. 2006. “Libraries, Licensing and the Challenge of Stewardship.” First Monday 11 (7). http://firstmonday.org/ojs/index.php/fm/article/view/1364. 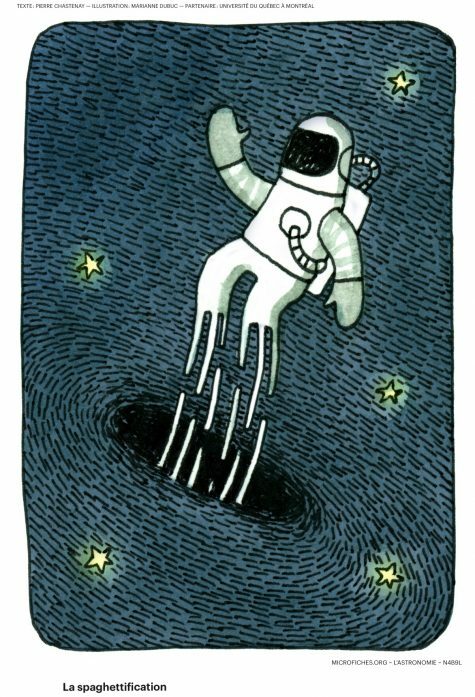 Frischmann, Brett M. 2012. Infrastructure : The Social Value of Shared Resources. Book, Whole. New York: Oxford University Press. Garnett, Nic. 2006. “Automated Rights Management Systems and Copyright Limitations and Exceptions.” WIPO. http://www.wipo.int/edocs/mdocs/copyright/en/sccr_14/sccr_14_5.pdf. Gillette, Clayton P., and Margaret Jane Radin. 2000. “Interpretation and Standardiziation in Electronic Sales Contracts XML and the Legal Foundations for Electric Commerce Online Standardization and the Integration of Text and Machine The Robert L. Levine Distinguished Lecture Series.” Southern Methodist University Law Review 53: 1431–46. Gordon, Wendy J. 1982. “Fair Use as Market Failure: A Structural and Economic Analysis of the Betamax Case and Its Predecessors.” Columbia Law Review 82: 1600–1657. Hirtle, Peter B., Emily Hudson, and AndrewT Kenyon. 2009. Copyright & Cultural Institutions : Guidelines for Digitization for U.S. Libraries, Archives, & Museums. Monograph. Ithaca (New York): Cornell University Library. Hudson, Emily Burrell, Robert. 2011. “Abandonment, Copyright and Orphaned Works: What Does It Mean to Take the Proprietary Nature of Intellectual Property Rights Seriously.” Melbourne University Law Review35: 971–1004. Larivière, Jules. 1989. “Les Exceptions Applicables Aux Bibliothèques et Aux Centres de Documentation En Matière de Droit d’auteur.” Documentation et Bibliothèques 35 (4): 135–42. Luhmann, Niklas, Klaus A. Ziegert, and Fatima Kastner. 2004. Law as a Social System. Oxford Socio-Legal Studies, Book, Whole. Oxford; New York: Oxford University Press. Mackaay, Ejan. 2008. “The Economics of Intellectual Property Rights in Civil Law Systems.” In Economic Analysis of Law – A European Perspective, edited by Aristides N. Hatzis, 1–23. Cheltenham, UK: Edward Elgar. ———. 2013. Law And Economics For Civil Law Systems. Northampton, MA: Edward Elgar. Mackaay, Ejan, and Stéphane Rousseau. 2008. 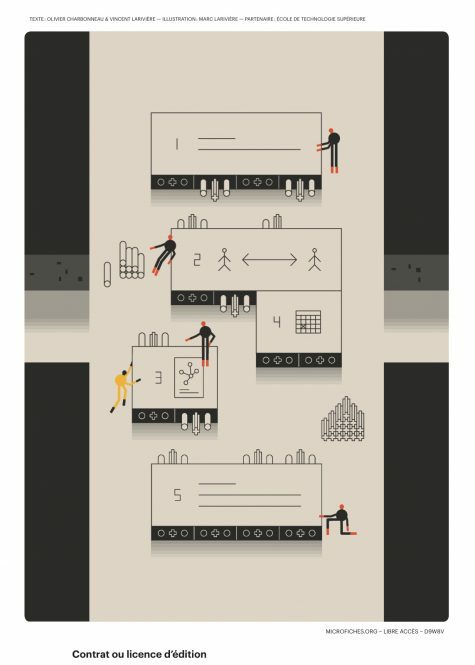 Analyse Économique Du Droit. Vol. 2e éd. Méthodes Du Droit, Book, Whole. Montréal; Paris: Éditions Thémis; Dalloz. Maurel, Lionel. 2007. 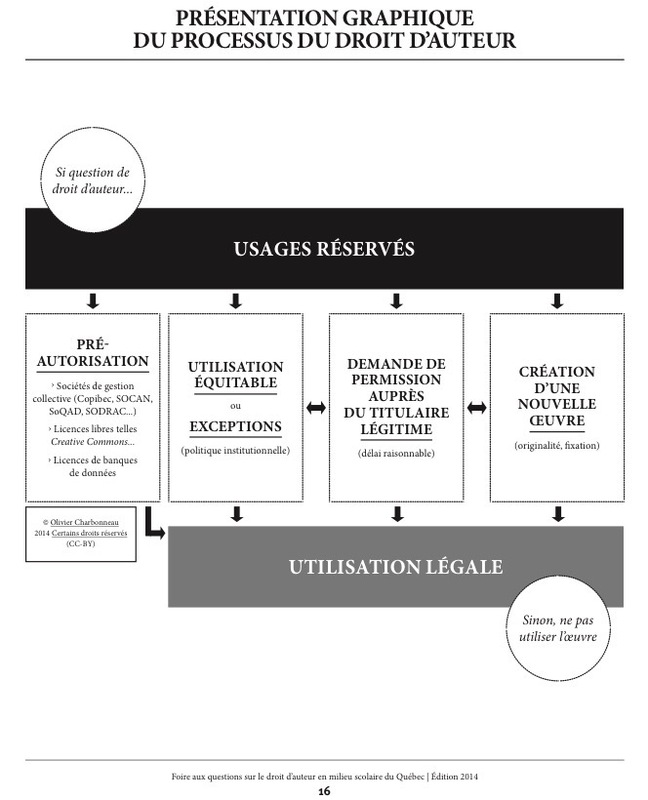 “Panorama Des Systèmes de Métadonnées Juridiques et de Leurs Applications En Bibliothèque Numérique.” Les Cahiers de Propriété Intellectuelle 19 (1): 241–76. Mountain, Darryl. 2003. “XML E-Contracts: Documents That Describe Themselves.” Int’l J.L. & Info. Tech. 11: 274–85. Rosén, Jan. 2012. “La Diffusion En Ligne et Le Régime de Licence Collective Étendue (« ECL ») Des Pays Nordiques – Les Œuvres Orphelines Comme Précédent.” Les Cahiers de Propriété Intellectuelle 24 (2): 321–46. http://cpi.robic.ca/Cahiers/CPI%2024-2/CPI%2024-2%20mai%202012.pdf. Trudel, Pierre. 1997. Droit Du Cyberespace. Monograph. Montréal: Les Éditions Thémis. Waller, Andrew, and Gwen Bird. 2006. “‘We Own It’: Dealing with « Perpetual Access in Big Deals.” Serials Librarian 50 (1–2): 179–96. http://0-search.ebscohost.com.mercury.concordia.ca/login.aspx?direct=true&db=a9h&AN=22526189&site=ehost-live&scope=site. Yoo, Christopher S. 2007. “Copyright and Public Good Economics: A Misunderstood Relation.” University of Pennsylvania Law Review155 (3): 635–715. https://doi.org/10.2307/40041335. Ce contenu a été mis à jour le 26 septembre 2018 à 4 h 03 min.